Aikatsu Friends! – 026 | Mezashite! 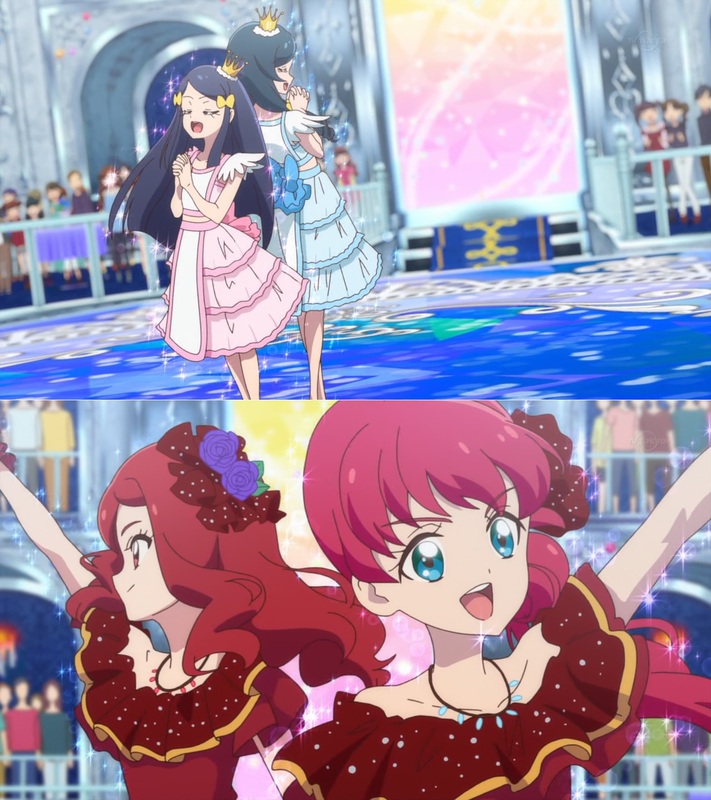 Today is a very special day, because October 8th marks the six year anniversary of Aikatsu, and with that, October 10th will mark the sixth anniversary of Mezashite too. Here’s to six more years, and many more after! personally I really dislike the ED song, but the way it’s directed is great. I’m not putting down your opinion, just interested because I like seeing how opinions differ. on the other hand i like the OP. As I said to Akatsukin, I seem to only really like Digz Inc’s songs for the series. To each their own! as always, Aluria, keep your comments coming! I always enjoy seeing them. interesting! I think for me the ED just has a little more the intensity I’m into, I think? Meanwhile, when I was watched the raws I wasn’t quite as into the new OP, although it’s grown on me. guess we have opposite taste! i totally get you! the OP isn’t very OP-y and even despite liking the song I totally felt the same way. I like all the energy the ED has and definitely feel it’s more energetic even if I dislike the song itself, so I absolutely see where you’re coming from! My favourite new song is ‘Mitsukeyou yo’, which hasn’t been in the anime yet, and I think it should’ve been the OP over what we got but I can’t complain. I’ll refrain from talking about it further because I know Akatsukin doesn’t like spoilers! I’m not a fan of either the OP or ED. Usually it doesn’t take me long to warm up to anime songs, but in this case, I find them too generic. Maybe I just got spoiled by the previous ones, which were really good. You guys brought to me what I now call my favourite series of all time. It means so much to me and you guys gave that to me. Thank you so, so much for everything these last six years and may you bring us more Aikatsu for many years to come. To start off with: happy birthday! Still this episode leaves me with a rather strange feeling.If you look at how the episode is structured. Pretty much glossing over every performance for the cup, except for the pure pallette one and throwing up a lot of dust over the moon pair forcing their performance to the next ep. There has to be something special with this performance, but it didn’t show that clearly. (Atleast Yume had her rainbow to show she went in overdrive in a performance.) The audience seems to dig it well enough, even Homey Cat praises them but I can’t shake the feeling Mio and Aine aren’t going to win this one. Singling out the moon pair performance for the next episode seems to point to them winning. On top of that you have that weird rallying exchange right before the performance between Mio and Aine. On the surface it seems normal enough but still something about Mio manners makes it seem a bit off. And as a final blow there is that screen right before the end of part A with Karen and Mirai looking in a very serious and somewhat offsettling way at Mio and Aine just after their performance. Ah well, let’s see what the next episode brings. I think the Moon twins are going to win, but then Kaguya will actually disappear like the prediction said, spurring the runner-up Pure Palette to take their place in the Diamond Friends Cup. Happy 6th anniversary! Also, is it just my imagination that the ‘Tatta tararatta…’ part during the new opening sequence sounds a lot like something out of a Mcdonald’s commercial? Snow White Maidens, they’re mightily winsome!